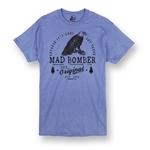 Be a Mad Bomber® Bombshell. Maybe your head is cold. Maybe your head is feeling unfashionable. Either way, a Mad Bomber hat is the perfect accessory—whether you need a hunting hat or a posh pillbox, a cozy knit cap or a beautiful bomber. It’s fantastic fashion at the drop of a hat.